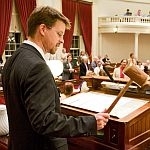 The Vermont State Legislature made history this week in overriding Governor Douglas’ budget veto. Bob Kinzel’s guest is House Speaker Shap Smith. He discusses the dynamics of this historic vote and looks ahead at what impact it will have on the key issues that will be debated in next year’s legislative session. We also have analysis of the news with a VPR reporter.